The history of wine in Montepulciano extends back to the Eutrscans. Il Conventino covers 50 acres in the heart of this area and is situated 1,150 feet above sea level between Val di Chiana and Val d’Orcia. 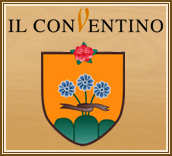 Il Conventino was one of the first wineries in the area to adopt organic farming while using traditional wine making processes in the cellar.